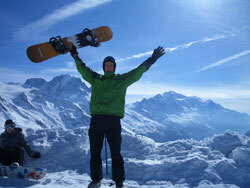 French and Sports in Chamonix! The French commune of Chamonix sits higher than the tallest mountain in England, yet the gargantuan French-Swiss Alps tower over it still, making it a fantastic base from which to go skiing or boarding in the winter and enjoy biking, climbing and many other outdoor sports in the summer. I visited Chamonix in the winter and could not recommend it enough! If I could go back every year I would. Very close to the town centre, within easy reach by public transport are several different resorts and slopes that cater from the complete beginner (me!) to much more advanced winter sports specialists.